We've seen some elaborate ways employees have quit their jobs -- but this one takes the cake. 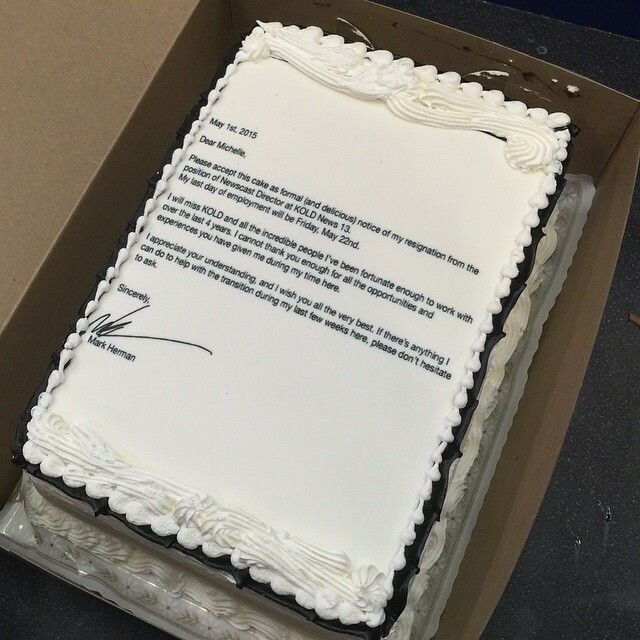 Mark Herman, a newscast director at KOLD in Arizona, handed in the sweetest resignation letter in the form of a cake. "I handed in the most delicious letter of resignation ever," Hermand wrote on Reddit. The post quickly got tons of attention ... and became a breeding ground for loads of cake puns. Herman told blogger Jim Romenesko he knew his colleagues would be disappointed with his departure, so he wanted to soften the blow -- explaining "nobody can be mad or sad at a cake." He clearly took a recipe out of former UK Immigration Officer Chris Holmes' cookbook. Holmes resigned using a cake, saying he wanted to spend more time on his dessert business. Quitting isn't always a piece of cake -- when Marina Shifrin quit her job at a digital content production company, she decided she'd do an interpretive dance to break the news. Her employer responded with their own video announcing they were hiring.